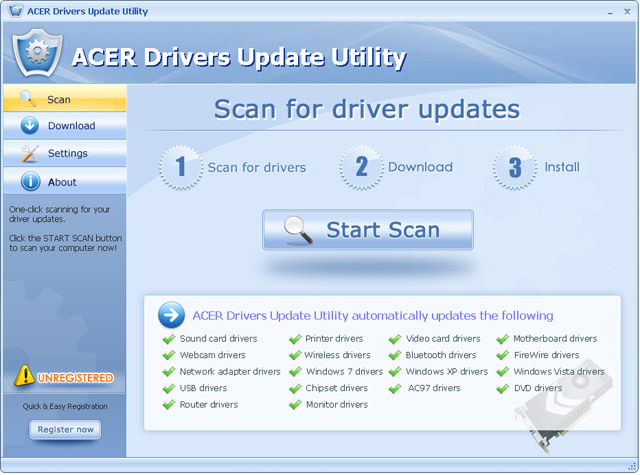 Acer Drivers Update Utility For Windows 7 64 bit updates your Windows 7 64 bit drivers for Acer Laptops automatically. It will scan your Windows 7 first then download and install 64 bit Acer official drivers to your Acer Laptop. The Acer Driver Utility keeps your Windows 7 x64 (64 bit) system up-to-date. It detects which driver updates are relevant to your computer, and then helps you install them quickly and easily. Qweas is providing links to Acer Drivers Update Utility For Windows 7 64 bit 2.9 as a courtesy, and makes no representations regarding Acer Drivers Update Utility For Windows 7 64 bit or any other applications or any information related thereto. Any questions, complaints or claims regarding this application Acer Drivers Update Utility For Windows 7 64 bit 2.9 must be directed to the appropriate software vendor. You may click the publisher link of Acer Drivers Update Utility For Windows 7 64 bit on the top of this page to get more details about the vendor.